Have you found any good books in funny places around Wales lately? If so, you may have stumbled across a web phenomenon which is quietly spreading across the country - the BookCrossing.com experience. To take part, people register their books at a website then set them free "in the wild" for other people to read, review and release once again. Perhaps unsurprisingly, BookCrossing.com started in the US, but the idea has taken off internationally, with some members releasing literally hundreds of books for others to find. 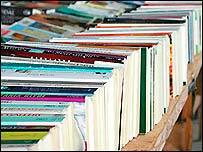 At the time of writing, there were 56 books released in Wales in the past 30 days that have not been found - and their locations are as diverse as their titles. For instance, if you happen to be passing a ruined castle "near the sea" in Aberystwyth, you might be able to find a copy of Are You Experienced? by William Sutcliffe. According to the reviewer, Jo-jo, the travel book "really opens up the world (good and bad) of backpacking and travel!" He or she hopes that whoever finds the book will also leave the book "somewhere quirky" after reading it. Meanwhile in Wrexham, public transport has proved popular as a release site, with two books left on the number 26 bus to Mold and two on the train from Chester to Birmingham. Looking at Welsh members' details, it seems that many have joined in the past couple of months, but some date back as far as last year. The website began in 2001, and now has books registered in over 80 countries, from Afghanistan to Vietnam, although it must be said in some cases this is through US travellers leaving books behind after a visit. From clicking through the BookCrossing website, it becomes clear that it has become a springboard for local and international friendships, as well as a way of spreading literature in all shapes and sizes. Many cities - apparently including Cardiff, although there is no official link for it - now have groups for "bookcrossers". Each group meets up on the second Tuesday of the month at 1900 local time for "informal, social interaction", as the website puts it. Bookcrossers have also set up bookrings, where they send a book on to another member for them to enjoy and review, who in turn passes it on. And in Europe, members from a number of countries have started writing their own book, in the form of a journal, which is posted or passed on to those who want to take part in writing it.